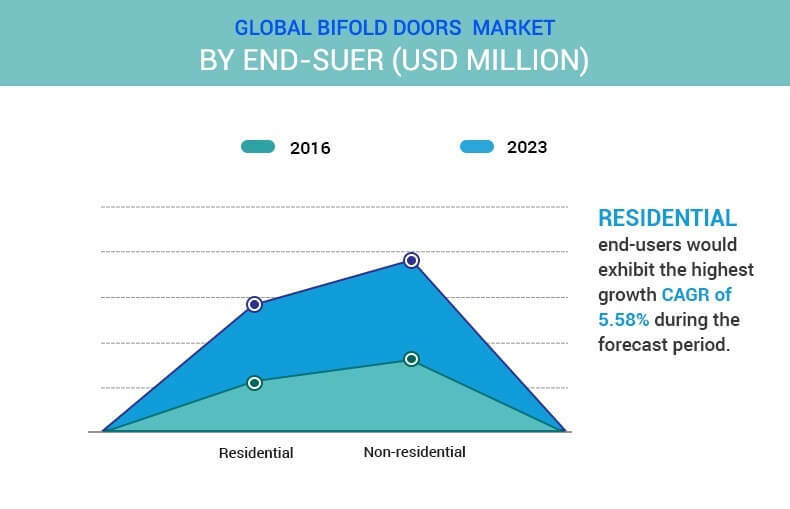 Bifold Doors Market was valued at $9,779 million in 2016 and is expected to reach $13,929 million in 2023, growing at a CAGR of 5.2% from 2017 to 2023. Doors constitute a vital part of the infrastructure as they provide entry as well as exit points. Further, they provide insulation, separation of rooms, and protect the interiors of the house from external temperature conditions. Bifold doors constitute a combination of panel doors logically hinged, leading to folding of the panels. This folding mechanism allows the doors to co-exist as door-walls systems, which enhances the visual appeal of the interiors. Bifold doors are applicable in patio doors, balcony doors, interior dividers, a combination of glass and wall systems, and store & restaurants front doors among others. They can also be used for large cabinets, in-built closets doors that require minimum opening and closing space, and suitable for replacement doors. The demand for global bifold doors is driven by growth in demand for efficient doors that offer sufficient insulation as well as heat retention through the material of the panels. In addition, these doors are appealable as door-wall systems and require minimum changes in the architecture for maximizing the space. However, the high cost associated with these doors, owing to use of multiple panels for folding mechanism is expected to hinder the market growth. In addition, installation of bifold doors requires careful and precise hinges of panels to enable a proper folding mechanism; thus, they are usually difficult to set-up for do-it-yourself users. The bifold doors find their application as patio doors, balcony doors, interior dividers, room separators, and as closet doors among others. The exterior bifold doors are expected to dominate the market share in the forecast period owing to significant adoption of energy efficient patio and balcony doors. The bifold doors market is segmented on the basis of material, application, end user, and geography. On the basis of material, it is classified into wood, metal, glass, vinyl, fiberglass, and others (uPCV, PVC, and fiberboard). The applications covered in this study include interior doors and exterior doors. Based on the end user, the market is bifurcated into residential and nonresidential. Geographically, it is analyzed across North America, Asia-Pacific, Europe, and LAMEA. The key players operating in the global bifold doors market are Andersen Corporation, BiFolds BiDesign Ltd., Chase Windows Co., Euramax Solutions Limited, JELD-WEN, Inc., Kloeber, Nana Wall Systems, Inc., Origin Frames Ltd., Pella Corporation, and The Bi-folding Door Company. North America is expected to offer lucrative growth opportunities, thereby registering the highest growth rate, owing to increase in expenditure on home remodeling and rise in consciousness towards interior decorations. Rapid urbanization globally and increase in disposable income are expected to boost the demand for bifold doors in the future. Further, growth in awareness among individuals towards interior designing and their propensity to spend on home remodeling are anticipated to fuel the demand. In addition, bifold doors offer a significant view of the outside, and subsequently enhance the visual appeal of the infrastructure in the individual’s perception, especially in resorts and the hotel industry. However, the involvement of multiple hinges and panels for folding mechanism of bifold doors present a major challenge. 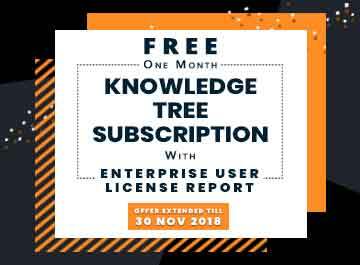 As a result, they are usually challenging for do-it-yourself (DIY) users, which is projected to hinder this market. Moreover, the initial installation costs associated with bifold doors increase as the door size increases, impacting the growth further. 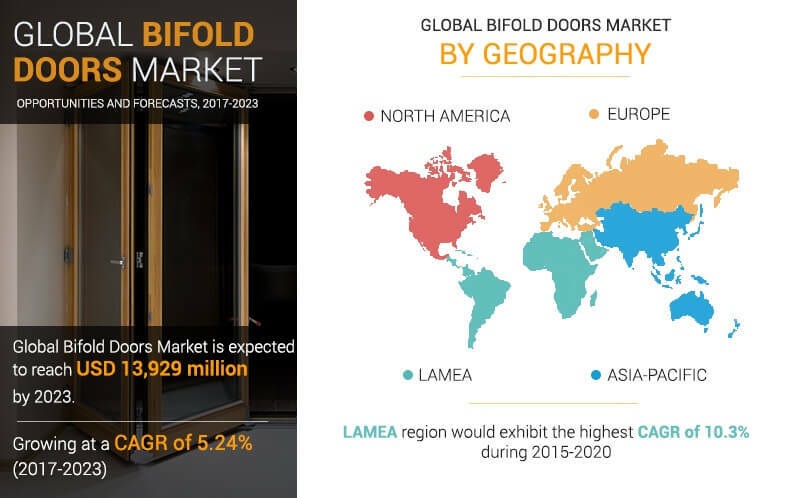 The study provides an in-depth analysis of the global bifold doors market and current & future trends to elucidate the imminent investment pockets. The quantitative analysis of the global bifold doors market from 2017 to 2023 is provided to determine the market potential. 8.7. NANA WALL SYSTEMS, INC.
Bifold doors consist of a bifolding mechanism attained via multiple folding panels of the doors. These doors are used as patio doors, balcony doors, interior dividers, and closet doors. 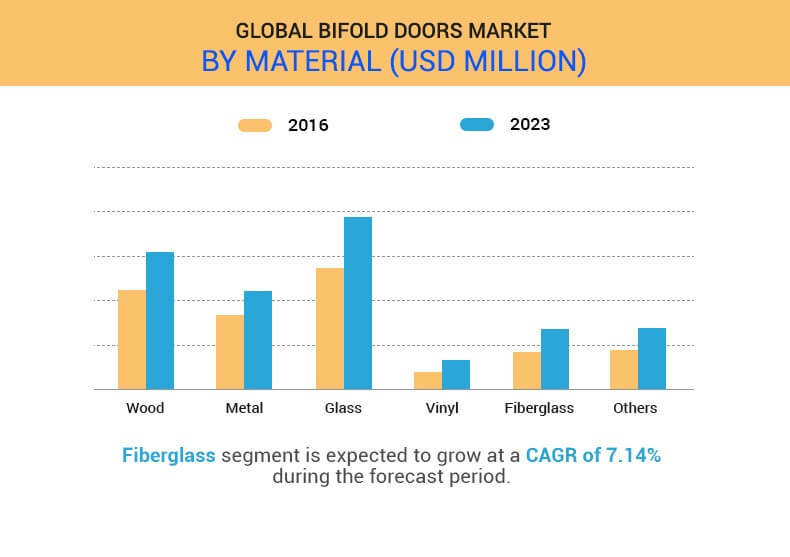 At present, the glass segment accounts for the largest share of the global bifold doors market However, fiberglass is expected to exhibit the highest growth rate of 7.1% during the forecast period, owing to the lower maintenance costs and superior insulation offered by fiberglass bifold doors. In addition, increase in adoption of energy-efficient doors and application of bifold doors as door-wall system are anticipated to drive the market in the future. The nonresidential end-user segment accounted for a major share in 2016, owing to their application in hospitality, resorts, and interior dividers. However, the residential segment is expected to witness a lucrative CAGR, owing to the rise in consciousness towards interior decorations and surge in disposable income of the individuals globally. Applications of bifold doors as patio doors and balcony doors in exterior doors are expected to witness the highest growth during the forecast period.